One of the most popular questions I get asked when I meet couples is, how long have I been a photographer and how did I get started as a wedding photographer? So, I decided…I should probably write post about it. I pretty much knew from an early age that I wanted to be a photographer, initially a sports photographer because as a teenager I was a big sports fan, in particular athletics. However, my career choice got put on the back burner as I just didn’t know how I could possibly make a living out of it. So, instead, I decide that taking images of the inside of people was a more appropriate career choice and I became a radiographer. I followed this path for 20 years and I still do it part time as I genuinely love it and don’t want to give it up. Besides, the skills needed to be a radiographer are pretty much the same as being a wedding photographer,that is, I working under pressure to a tight deadline, only have one chance to get it right, working out exposures and putting people at ease straight away. However, the love and passion I have for photography was always there through those early years. I never went anywhere without my camera, feeling completely naked with out it. I shared my enthusiasm with my father-in-law. He was the one that made me pick up and buy a proper camera, a Nikon D70 DSLR. He lent me some lenses, I bought every photo magazine, read every book and on line article and took hundreds and thousands of photographs to perfect my techniques. My passion was fast becoming a fully fledged skill put together with artistic eye ( I did A level Art and got an A) meant I was starting to produce some decent photographs. And then it started, friends and family started asking me to take photos at their special occasions because I had a proper camera and was able to produce nice photos for free. Still, at this point, I did not think I could make a career out of photography. I was what they call an enthusiastic hobbyist. I WANT TO BE A WEDDING PHOTOGRAPHER ! It was just over three years ago, around this time our good friends Debbie and Tom where getting married at The Hotel Van Dyke in Chesterfield. They had a wedding photographer, Rob from Red Snapper Photography, we were invited and they would be really happy if I brought my camera and captured a few candids of the wedding day. No problem, it was photo heaven for me! A lovely venue, free alcohol and good food, great company, this was definitely going to be wedding of the year in our social calendar. Mike and I were so excited, we had a great time and I took my candids, mainly whilst stalking Rob the wedding photographer who I’m hoping didn’t mind. Then we went home and I thought nothing more of it till a few days later. I edited my photos, sent Debbie and Tom a copy of them and waited for the polite thank you for your snap shots text message. The response was not what I was expecting, they loved them! Plastered them on social media and couldn’t stop thanking me enough for the beautiful photos. Then other people that I didn’t even know started to say they loved them. Could this many people be wrong? Was I really up to photographing a wedding? The thought would not go away, like one of those annoying songs that gets stuck in your head, over and over the same thought, you can do this, you can be a wedding photographer! 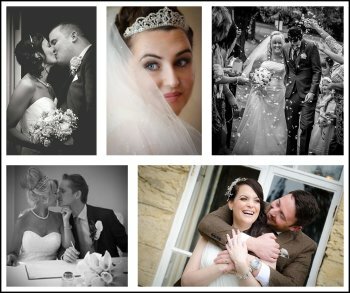 So in March 2015 I signed up for a wedding photography course at Nottingham University, pestered every photographer in Sheffield to give me some experience and offered my services for free to anyone willing or mad enough to do allow me to photograph their weddings with so little experience. I can’t thank those couples enough from 2015 for having faith in me and supporting me. I am still in contact with most of them and they are some of my biggest fans and supporters. Still, the idea of turning photography into full time business was a daunting one but I was determined and full of ambition by this point to make it work. The decision to turn my passion into a business happened on 1st August 2015. The official date that Sharon Trees Photography was born. Believe me that was the hardest and definitely the scariest moment of my life and I knew it was going to be a long and hard struggle to make my business work. Suddenly, over night I was a business woman and quite honestly I hadn’t got a clue what I was doing! I had zero business experience! What was I thinking ! Thank god for two people, my husband Mike (a business manager) and my accountant Sue. Between them they taught me how to run a business. What a steep learning curve that was ! If I can give one piece of advice to anyone thinking of starting their own business it would be that, you have got to be prepared to put every waking hour into it, be 100% behind your business and have the ambition and drive to want it to succeed more than anything in the world. You eat, sleep and breathe it! I very rarely get a proper day off now, work a 60 hr week and have very little no social life! Would I change it… HELL NO ! I LOVE IT SO MUCH ! So, that’s how I got started as a wedding photographer. It was a long journey and it didn’t happen over night! When I’m stood at the top of that aisle blubbing my eyes out behind my camera because I’m witnessing two wonderful people getting married, that they have choosen me (yes me!) to capture those moments, I feel so humble, so happy and that’s the best feeling in the world! Nothing beats that !